The above photo was taken by Michaela Adams at Aonach Australia, hosted by CSU Wagga Wagga (NSW) during March 2013. 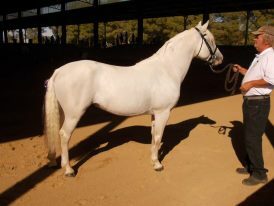 Snowy featured in the Stallion Parade. Glenormiston Snow Fox’s pedigree contains the Blue Line (Abbeyleix Finbar, Carna Bobby, Cannon Ball) on his sire side as well as his dam side (Domo Cavallo Praize, Island King). 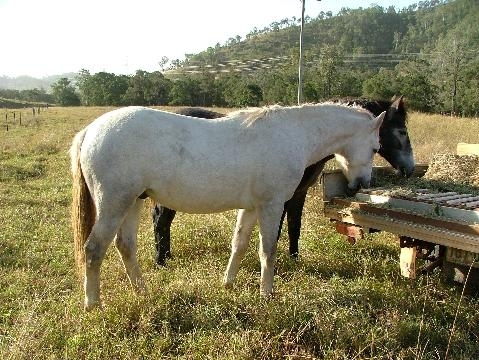 There is a small influence from the Red Line (Whalton Sandune, Macdara, Connemara Boy) and the Green Line (Tully Lad, Mountain Lad) in the fourth generation of his pedigree. 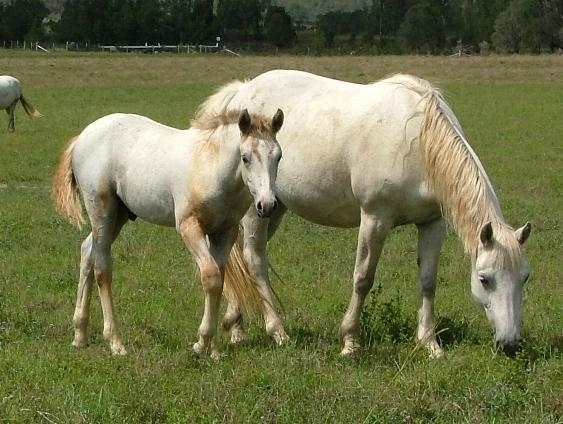 Also in the fourth generation of his pedigree, Snow Fox goes back to Silver Snow by Snowball on his dam’s side through Washlands Rebecca (dam of Glenormiston Celebration). Glenormiston Snow Fox as a young colt at Glenormiston Stud, photo courtesy of Glenormiston Stud. Glenormiston Snow Fox arrived at Dylanglen Stud as a young colt during January 2009. When he came off the truck at the front gate we were simply breath taken. 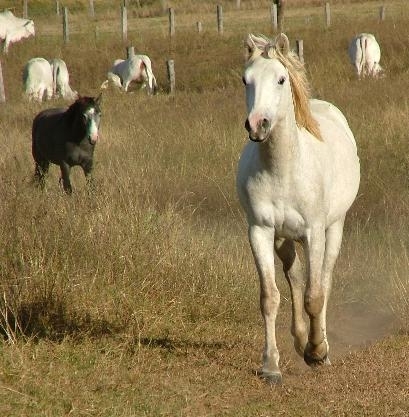 He was a beautiful looking young colt with some sort of “presence” about him. This was the first time we saw him in the flesh, as we had complete trust in dealing with Sue Clarke. We were very excited to have the opportunity to purchase this young boy from Glenormiston Stud, particularly because the S.O.D is Domo Cavallo Praize (who’s reputation proceeds himself). We found out that Snowy has brothers competing successfully out in the eventing world so we jumped on the opportunity to purchase him straight away. He is also the last colt bred out of Abbeyleix Finbar. We have always had bloodlines from Abbeyleix Finbar in our stud and have found all of his progeny to be of a sweet and gentle nature. Our Snowy is no exception to this. 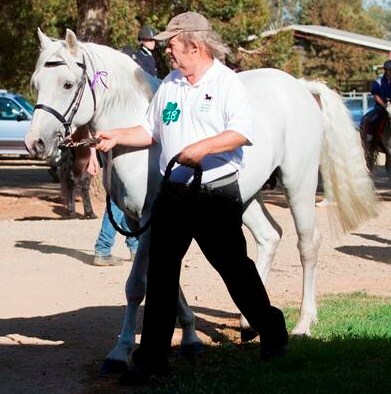 Snowy passed his classification at CSU Wagga Wagga in 2010 and is registered as a Class One Connemara Stallion with the CPBSA. This fellow has a sweet and gentle nature. He is a nice solid boy with good bone and strong legs. 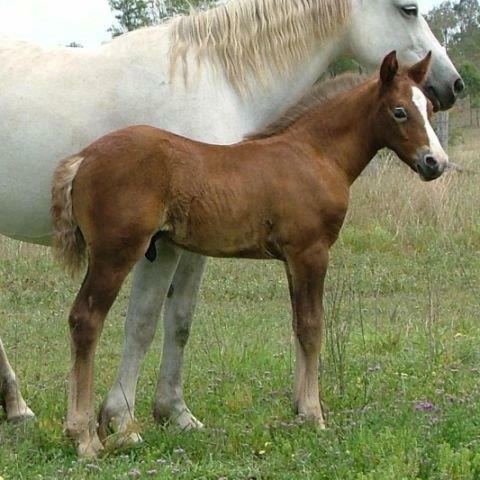 He was born chestnut and is now white. He does have that “presence” about him and his white coat shines up very nicely. He covers alot of ground when he shows off in his paddock to the girls. Snowy resides at Morven with Michaela Adams. He will have more time spent with him during 2014 now that Michaela’s son Ryan is one year old. 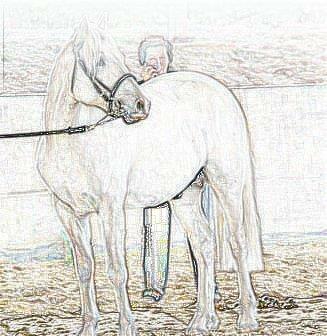 Expect to see him on the local show circuit later on in the 2014 year. At the end of the year (approx) Snowy will have his first girlfriend. We look forward to seeing how his progeny come along. He will breed future pure-bred and part-bred Connemara’s at Dylanglen Stud, but we consider him a valuable contributor to our future part-breds.